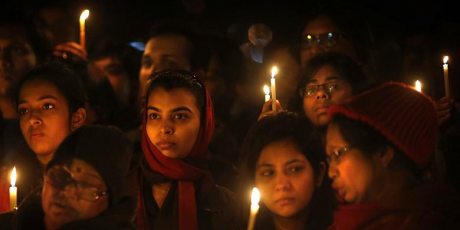 She was a 23-year-old physical therapy student who boarded a bus in Delhi last month. Six men locked the door, and savagely raped her for hours, including with a metal rod. They dumped her naked in the street, and after bravely fighting for her life, she died last weekend. Across India, people are responding in massive protests to say enough is enough. In India a woman is raped every 22 minutes, and few see justice. Globally, a staggering 7 in 10 women will be physically or sexually abused in their lifetime. This horror in Delhi is the last straw -- it's 2013, and the brutal, venal, global war on women must stop. We can start by drawing the line in India. The government is accepting public comments for the next 24 hours. We urgently need both stronger law enforcement and a massive public education program to change the grotesque but common male attitudes that permit violence against women. If 1 million of us join the call for action, we can help make this young woman's horror the last straw, and the beginning of a new hope. Sign the petition on the right now!